Sydney was a 16 hand, 2002, New Zealand Thoroughbred. His previous owners really wanted him to be a hunter/jumper. They tried, he tried, but he didn't enjoy the work and frankly, it stressed him out a little bit. He enjoys working on the flat though, and decided that dressage might be more up his alley. Enter a new trainer. 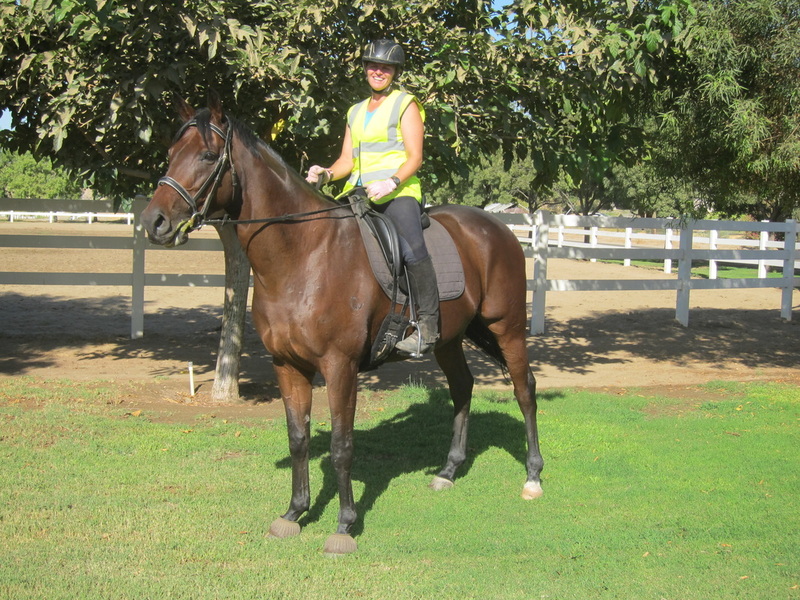 Yep, dressage was a better fit, and he was put up for sale as a lower level dressage horse with potential to do more. After driving north to find Sydney, the trip had to be repeated to go and get Sydney. Again, Taz's mom and Cha Ching's mom offered to come with me, but only Taz's mom could go back the very next day. We were very lucky the next morning as the temperature had dropped almost 30 degrees, and rain had swept across the northern part of the state. The trip would have been a hot, noisy one for Sydney had we not had that little break in our oppressively hot summer. We left around 8:00, escorted up the valley by billowing black clouds that provided a nice break from the searing sun. We pulled into a wet and muddy Sport Equine, but the air was dust free and the horses were friskier than they had been the day before. Uh-oh, both Taz's mom and I exclaimed simultaneously. Sydney, calm as a turtle the day before, was dancing in his stall, looking to MOVE! There was no need to worry. He loaded just fine, rode all the way home quietly - even during a gas stop, and unloaded without too much trouble. Here's some video of his first half hour at the barn. I only edited out the really boring parts. Having only had registered Arabian horses (since I grew up and left home), I am only familiar with how the Arabian Horse Association tracks horses. Essentially, if a sire and dam are registered purebreds, the foal is also eligible for registration. Over the years the process has changed somewhat, but essentially, the owner submits the foal's DNA sample, includes the sire and dam information, pays the appropriate fees, and the foal is now a registered Arabian. Now that Arabians are no longer branded, tracking the registered name and parentage of an Arabian requires DNA testing. It's much easier to do if registration papers have not been lost. 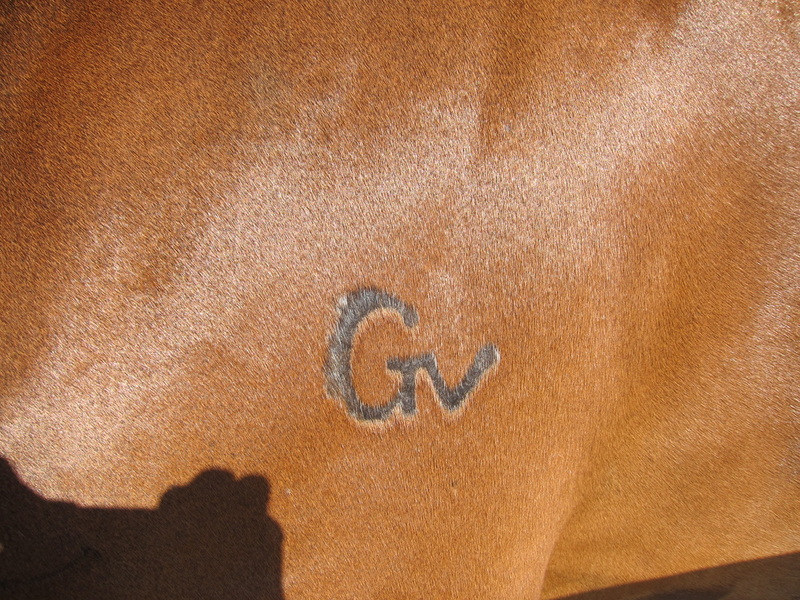 The brand pictured is from my purebred Arabian mare (deceased), Montoya DSA. The first symbol indicates that she was purebred. 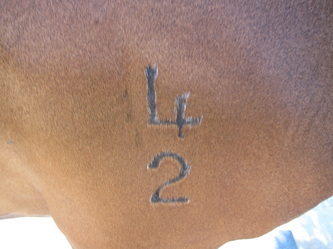 There is a similar symbol for half-Arabians. 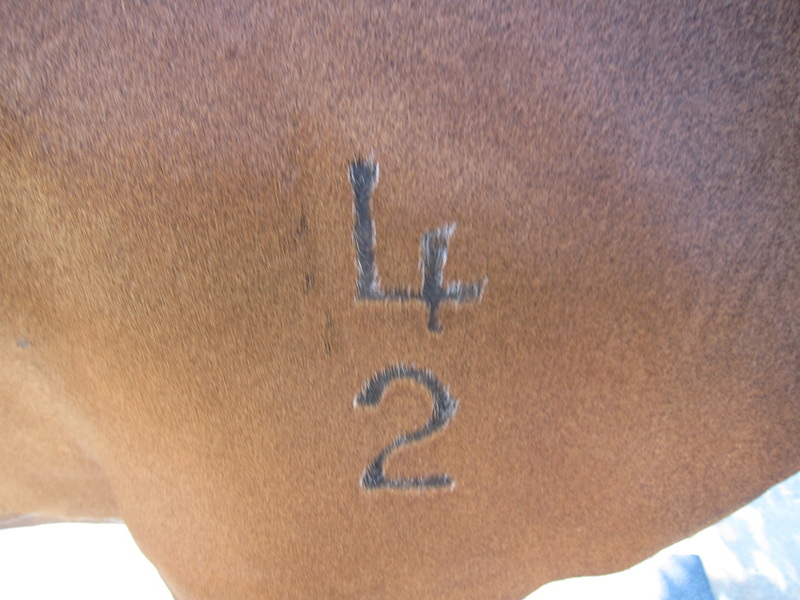 The two stacked symbols to the right of the purebred mark indicate her birth year. The top "arrow" is an 8, and the bottom one is a 9 - 1989. 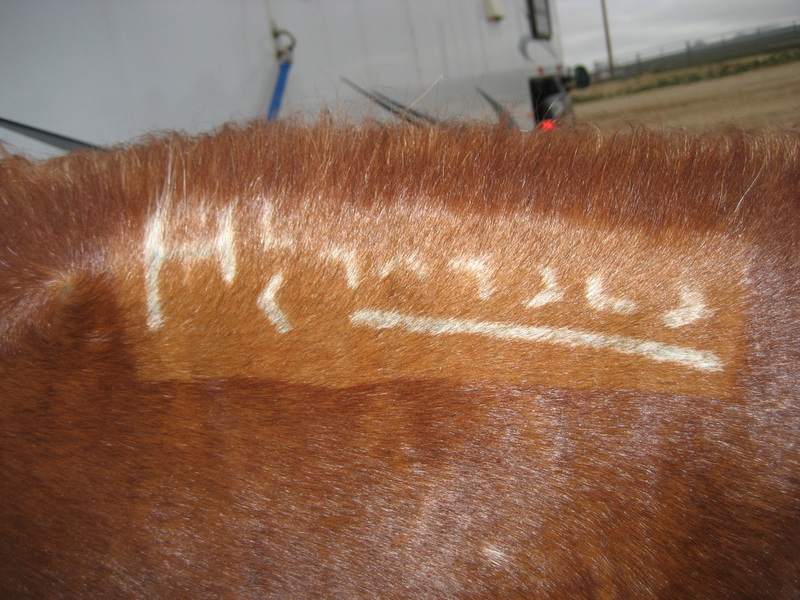 The symbols that are underlined are her actual registration number with the Arabian Horse Association. Speedy G, registered name G Ima Starr FA, isn't branded. His DNA was sent to AHA for recording. If he's ever lost or sold without his registration papers, his new owner would have to submit a DNA sample to have him identified. I am sure this is a somewhat costly procedure. When I bought Sydney, his United States Hunter Jumper Association card came with him. It listed a birthdate and his name, but nothing else to help identify his origins. A quick search of the NZ Racing's website revealed at least one error on the card which led me to believe there might be others. On his USHJA card Sydney's name reads, SYDNEY N2. Hmmm ... I entered that name in the data base of the NZ Racing search engine and saw lots of Sydney-type names with NZ beside them. I quickly realized the N2 was an error and actually stood for New Zealand, NZ. I downloaded the Request for Identification of a Thoroughbred Information form from NZ Racing's website, filled it out, scanned it, and emailed it with a credit card payment. I then held my breath. The next day there was an email from a real person in New Zealand. Sydney's information had been found! His race name was Pick a Card. His dam was Cataluna (NZ), and his sire was Magic of Sydney (AUS). His birthdate is actually October 4, 2002. I also discovered that Sydney, or Pick a Card, has a race record. It's a dismal record, which is probably a good thing for me. Had he been a successful race horse, he never would have made the trip to the USA. He wouldn't have been tried as a hunter jumper here, and he wouldn't have ended up at Sport Equine. Had he not made the journey from New Zealand to Clovis, California, he wouldn't be standing in my barn as you read this. Here's to the horses at the back-of-the-pack! Pick a Card was raced four times as a two-year-old in Catch Weight Races - (without restrictions as to weight). He finished near the back each time. Late in his two-year-old year he ran his first Maiden Catchweight Race (horses never having won and without restrictions as to weight), finishing second out of six horses. As a three-year-old he was raced in three qualifying races, and four actual races. Most of the time he was near the back, but he did manage a second place finish in one of his last qualifying races. Half-way through his three-year-old year, he was finished. He ran his last race in May 2006. I don't know much about horse racing, much less how they do it in New Zealand, but I did find some helpful information at Dummies.com. I have a sneaking suspicion that Pick a Card might be a "Heart Horse." During the first several days of being in my barn, he brought me to tears. They were the kind that just come welling up when you let out that last breath of tension and worry. He may well be the kindest and most gentle horse that I've ever owned. I think it is appropriate that my "Heart Horse" is called Pick a Card. I'll take the King of Hearts please. 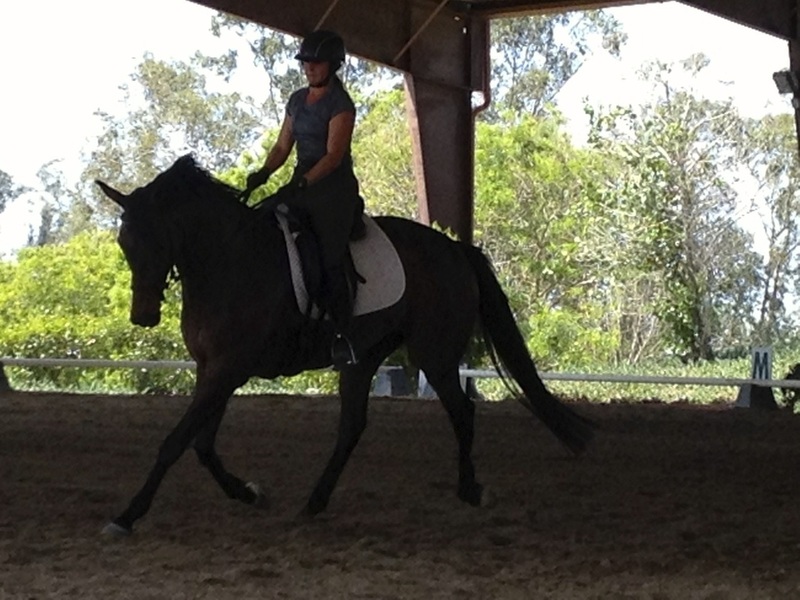 In November of 2014, I came to the painful decision that Sydney didn't enjoy dressage. In reality, he just couldn't relax into the work. It was obvious that he found it stressful. 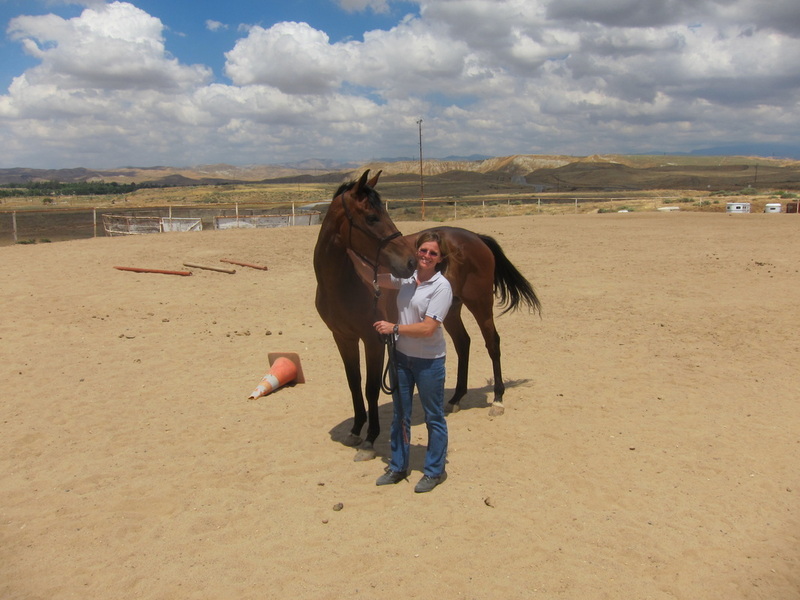 Sydney was returned to Sport Equine where he will eventually be placed in a new home.